My husband is becoming an old man. There was a band of bad storms coming across the area last night and he decided that he needed to stay up til 1 am to "monitor" the weather. Oh. Lord. He's become the man that monitors the weather. I have visions of us being old and me saying, "Honey, let's go out to dinner" and him saying, "Can't. There are storms about 100 miles off. I feel it in my knees." Y'all- this wouldn't scare me so bad, except that I see the example he's had in his life. Kamron's grandfather is the most weather obsessed person I've ever seen. In fact, we often joke around and ask him if he's afraid that his horse and buggy will get wet out in the driveway. He complains when it gets cold that his blood is like water and he's going to freeze to death in the comfort of his living room. He watches the temperature gage all. day. long. Just waiting. Waiting for rain or snow or cold or hot or for the moon to fall out of orbit or something. 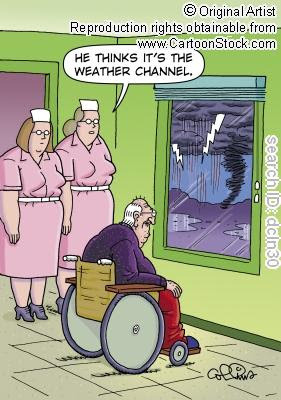 I fear that this is going to happen to darling husband. We are gradually becoming our old people selves. Me- more set in my scattered and overly talkative ways. Him- grounded and wise and worried about the weather. Yin and Yang. Balance. After Deadliest Catch (OMG- I LOVE me some Deadliest Catch) I announced that I was going to bed with my earplugs in. Around 1 am, in walks darling husband telling me that we are about to get severe weather and that he is going to get the children and bring them downstairs. I ripped out my earplugs. Did you just say you were going to wake up sleeping children? WHAT THE FRECKLE? I demanded that in NO way was the hubs to wake up Miles. Miles has been sick this whole week with a bad case of scarlet fever. I had visions of him staying up the whole rest of the night in a panic at being woken up and scratching his rash til he made himself (and the rest of us!) miserable. I told the man that I would personally run upstairs and rescue Miles in the case of a tornado in the front yard. He brought the big kids down, though so that in case of an emergency we'd only have to make a quick rescue of one. Noah in the middle of the night with his loud talking auditory processing stuff was just about more than this girl could handle. Sadie whined about why she had to get up. I wanted to say because daddy is becoming his grandfather, but I bit my tongue. The storm passed with nothing more than a little wind and some lightening. Big whoop. But I suppose, as the hubby reminded me many many times in the middle of the night, that the children sleeping under that roof that "could blow off" are valuable. Yeah, yeah. He's right. Remind me of that when we are all cranky the next morning from lack of sleep! Love his heart, though. I crawled back in bed, jammed my ear plugs back in my ears and tried to go back to sleep. I had visions of us getting really old sitting in the nursing home together holding hands. Our kids coming in to visit us and Noah's loud talking finally coming in handy because his dad's hearing aid batteries are dead and he's too frugal to buy a new one. Kamron eating the vegetables from our pureed dinners and me stealing his dessert. Him reading the Wall Street Journal and me circling the hidden pictures in the latest issue of Highlights. Him going over our financial statements and me writing checks to all the churches that come in and do music for us. Him exercising in his wheelchair and me doing roller derby up and down the halls in mine. Me stealing the remote and flipping it to E! while he says, "Dear, perhaps we should check on ... the weather..."